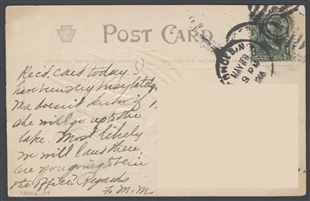 This colorful, embossed postcard was mailed to a lucky recipient on May 28, 1908. Publisher Julius Bien and Co. was known for its sentimental thematic cards. 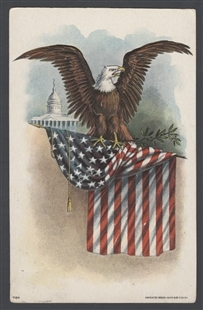 In the foreground are familiar patriotic symbols: a bald eagle and an American flag. The eagle is depicted with its wings extended, gripping a laurel branch and flag in its talons. In the background, the front of the Capitol Building completes the classic composition.